The principles are the same whether managing individuals or teams, but there are extra dimensions to team management. For a start, a manager has to bring together diverse talents, define goals for the team, harmonise efforts and manage the relationships between team members. Additional management training may be necessary to acquire these leadership skills, as group dynamics are complex and shift quickly. A manager has authority, of course, but unless it is backed up with a vision for the team and consideration for their relationship with team members, that authority may be undermined. The leadership qualities required can, to some extent, be determined by the nature of the team a manager is working with. For instance, an underachieving team needs an authoritative figure to set a clear direction, but a talented, successful team needs more democratic leadership. When a team is in conflict it needs a leader who can re-establish good relationships, but a manager who can combine all of these leadership skills will be the most successful in the long run. A manager has to examine the strengths of their team, define its main purpose and outline this purpose to team members. It can be difficult to bring people together as a team. Try to create a common goal – high standards, mutual growth or recognition of good work – that everyone can believe in and will be willing to give up their time and effort to achieve. In all likelihood, team members will differ in their needs, motivations, ages, interests and cultural backgrounds. A manager must have the team building skills to ensure that each individual feels a valuable part of the team. 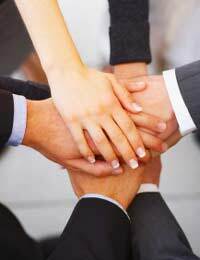 Try to create a climate of togetherness and motivate team members to work for themselves and the team. Discover the strengths of each employee and find the best way for each to work towards the team’s goals. Ascertain what each team member wants to achieve and provide as many opportunities as for them as possible. Effective project management involves encouraging the team to come up with creative ideas to solve problems and meet targets. Once ideas have been generated, the team can assess them and adopt the best one. A manager should listen to their team before offering their own thoughts, else team members may feel inhibited and hold back. It is okay; however, for a manager to steer the direction of team meetings and ask open questions that will lead to positive discussion. Leadership and management training can give a manager the project management and team building skills they needs. Remember the best leaders do not rest on their laurels but strive continually to improve their skills through leadership training. It is good leadership practice to take time out to review teamwork and to be ready to take the lead, but poor leadership practice to create barriers within the team, interfere if the team is working well or hang on to work that the team could do just as well. Leadership training can prepare people for management and can be of benefit whether a manager has been in the job for 10 days or 10 years. There is always a new management model on the horizon and keeping up to date allows a manager the flexibility that is essential to success.